Sook-hee: Let me show you what you've made me into. You can't say these out there Asian action flicks, are boring, cause they're not. They're the last thing from it. 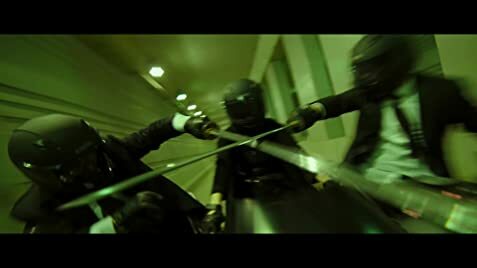 Starting with the bloodiest opening to end all bloody openings, we're virtually bombarded with carnage, where one woman taking out a sea of bad arses (swordsmen) in a hallway, slicing and dicing her way through em' with dizzying camera angles. We get to the next room, it starts up again (that first bare, slightly chubby chested guy, I can't get out of my mind) where the kill count increases. We've seen so much, bloodshed, already, this makes Kill Bill look small time, filling more buckets of hemoglobin, it would make even Tarantino, a jealous party. From this, a beautiful if relieved transition ensues, as we realize there's a real exciting story at play here, where a lot of it, borrows for Le Femme Nikita, or The Assassin, that 93 Bridget Fonda pic. Unfortunately it's a too muddled tale, or very messily organized back and fro structure, of a young gifted sword fighter and assassin used by an obviously corrupt organization to do their dirty work. Her problems are only extenuated with the arrival of a child which threatens her future and goodwill for both. Storywise, I thought the story would of lived up to the title, where the woman was a real evil character, but she isn't an evil person, where the title was kind of misleading. We are taken back to earlier times, where sporting the short hairdo, we see that may'be she was, or as she says, to a much hated figure, later, "You made me like this". by them (her masters). There was just such a messy approach to the back and fro structure, it was bloody annoying, where even Einstein would have trouble piecing it one hundred percent together, one head wracking experience for a layman. It's a pity as The Villainess, really could of been something, and speaking of The Assassin, earlier, one bathroom scene here, is horribly familiar, where I bet your bottom dollar, the writer here, saw that movie. But push that aside, The Villainess is still an excitingly explosive action pic, and surefire entertaining night at the movies. The film has some good acting, and the action scenes, especially the motorbike chase scene, are spectacularly staged, and I don't want to know how they went about that one. It just really suffers on the account of it's uneven and muddled telling and approach to story. 30 of 54 people found this review helpful. Was this review helpful to you?